Buying a news publication is generally not a good investment. Take 2017, a year when cable news revenue rose 10 percent. That year newspaper advertising revenue fell by the same amount. Daily newspaper circulation dropped 11 percent, marking the 29th consecutive year in which print circulations declined, according to a Pew Research Center analysis. Magazines have not been spared either. The circulations of Time and Newsweek, to name two prominent examples, have plummeted in recent years. Last year, Time reported falling revenues and decided to cut back its print editions. Yet none of that stopped Salesforce founder Marc Benioff and his wife Lynne from buying the magazine. Time’s parent company, the Meredith Corporation, announced the deal Sunday. The sale is the latest in a trend of billionaire entrepreneurs buying up news publications. Multi-billionaire Patrick Soon-Shiong bought the Los Angeles Times in June of this year. Lauren Powell Jobs, founder of the Emerson Collective, acquired a majority stake in Atlantic magazine in 2017. In 2014, Las Vegas casino mogul Sheldon Adelson bought the Las Vegas Review-Journal. The year before that, Amazon founder Jeff Bezos bought The Washington Post and Red Sox owner John Henry purchased The Boston Globe. Warren Buffett, the CEO of Berkshire Hathaway, became the owner of 63 daily and weekly newspapers in 2012. So why are billionaires spending their money purchasing newspapers and magazines that appear to be losing money? A mix of philanthropy, ego and ambition. “These are all people who have done something in business against great odds. They want to prove they can do something that other people say can’t be done,” said Ken Doctor, a media analyst who started the website Newsonomics. 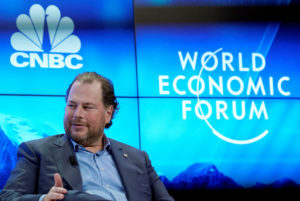 Benioff told The New York Times that Time has “great assets” and said the purchase was aligned with the kind of “impact investing” he does. Impact investing is the popular term for investments that are made to spur social or environmental good. That do-gooder mentality can have other indirect benefits for the new owners of these media organizations. Those billionaires often make a concerted effort not to influence the editorial direction of the news publications they own, but they do still have a seat at the table. “It’s indirect, but they’re in the conversation in a way they weren’t before,” said Rodney Benson, a professor at New York University whose upcoming book focuses on the changing media ownership landscape. Think about the Time magazine covers, like the annual Person of the Year. In 2017, it was the women from the #MeToo movement. In 2016, the Person of the Year was Donald Trump. Those magazine covers sparked a public dialogue, and Benioff will now be party to that. Time and other national publications are also household names and have reputations developed over decades. Such institutionalized brands do not come up for sale often and owning one can instantly put an entrepreneur in another league of influence. That influence is not new. For the first half of the 20th century, it was the norm for wealthy families like the Pulitzers, Hearsts and the Ochs-Sulzbergers to own news publications. Of course, owning a media company comes with its share of risks as well. Chris Hughes, a co-founder of Facebook, invested $20 million in The New Republic over four years before selling it to the publisher Win McCormack. In 2014, two years after Hughes bought the publication, dozens of New Republic staff members and editors also resigned en masse over the way the magazine was being managed. Under Hughes’ leadership, The New Republic was criticized for lavish expenditures and went through two redesigns that did little to boost the magazine’s bottom line. Media ownership also comes with the risk of getting caught up in the political fray. President Donald Trump has routinely criticized Amazon on Twitter. Many political watchers do not think Amazon would be targeted if Bezos did not own The Washington Post. So far, that has not put a dent in Amazon’s business. It just became the second U.S. company in history to be valued at more than $1 trillion. The Washington Post is also bucking the trend. It has made a profit for two years in a row. In 2017, the publication doubled its digital subscriptions and grew its digital advertising revenue. Bezos and The Washington Post might be the exceptions to the rule. But the appeal of having broader cultural influence, and the chance of turning around a dying industry, appears to be luring in more billionaires, not less. The stock market boom has given CEOs a raise. What about average workers?